Subsequently the name of the trailer was changed to “Aljo” following a legal suit by another company manufacturing a similar sounding product. 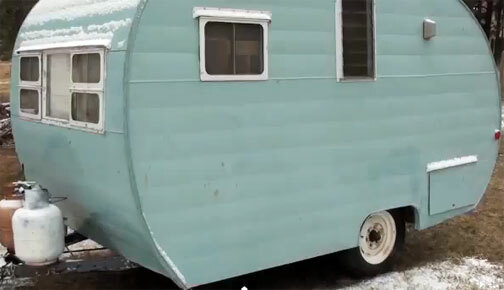 The trailer enjoyed great popularity in the 50's and 60's. The company flourished at a time when soldiers were returning home from the World War II and planning to start their own families. They were attracted towards great outdoors and the life of adventure – lifestyle where camping trips and travel played a big part. To meet the demand for an affordable, compact travel trailer during prosperous post-war times, many companies began manufacturing retro-trailers of various shapes and sizes. C.T. McCreary was one of such “practical and business oriented manufacturers” of trailers from that time. At first, trailers were named “Aljo” which was chosen personally by McCreary after seeing his friend’s boat named "Al-Jo". Subsequently an “a” was added to the name at the end so as to make the name sound more Californian. But the new name Aljoa was sounding very similar to the name of the giant corporation “Alcoa” (well established aluminum company). Soon after Aljoa started advertising in a big way their "All Aluminum Aljoa Trailers", the Alcoa Aluminum Company sued Aljoa for copyright infringement. This legal battle forced Aljoa to drop the "a" at the end of its name. For this reason, from 1957 onwards the travel trailers rolling out of the factory were emblazoned with the new "Aljo" name. Here it is - Aljo in the shape of Canned-Ham! Aljoa trailers followed the standard "canned-ham" profile. Such design allowed for an efficient use of interior space and was fairly easy to fabricate, unlike the more complex "aircraft" designs that were being riveted together by Airstream, Avion and others. Aljoa/Aljo trailers were manufactured in several different models and lengths from 1945 into the 1960's. They retained the classic rounded "canned ham" shape until 1964 when the new models debuted with a more "squared-off" profile. Aljoa/Aljo travel trailers are well built and just as popular today, as they were in the "golden era" of the 1950's and 1960's. This model introduced in the early 60’s was described as a self-contained model. It came with the choice of two decors: early American or modern decor. Likewise the bed choices were Gaucho bed divan or double bed. The overall length was 19ft 2 inches; body length was 16ft 8 inches and width 8ft. The trailer weighted 3100 lbs. The model was fitted with a 6 cubic feet Narcold dual energy (gas & electric) refrigerator and wall heater. It had gas water heater and twin butane tanks. The toilet was marine-type. For better comfort the sidewalls were double-insulated. All of sidings and roof were made of aluminum. Side and rear windows had jalousies and front window was dust proof ventilator type. The trailer came with 24 gallon pressure water system. The model claimed itself to be professionally planned with harmonized decor. The overall length was 27ft including 25ft of the body length; the width was 8ft while the interior height was 6 and a half feet. The trailer weighted 4820 lbs. The new and very practical feature of this model was a utility room providing 35 cubic feet of extra storage space. Pleated drapes, bath and wall heater were other additions that made this model very attractive.